Wild boar is a meat that a lot of people have heard of and maybe seen on a restaurant menu but few have cooked at home. To get the maximum flavour and richness from wild boar it needs to be cooked low and slow so this pie recipe is a perfect introduction to it. In keeping with autumn ingredients I have paired the boar with the earthiness of porcini as it is wild mushroom season after all. This pie can be made in advance and is a great crowd pleaser. I made the boar sauce a couple of days before I needed it which really intensified the flavour. 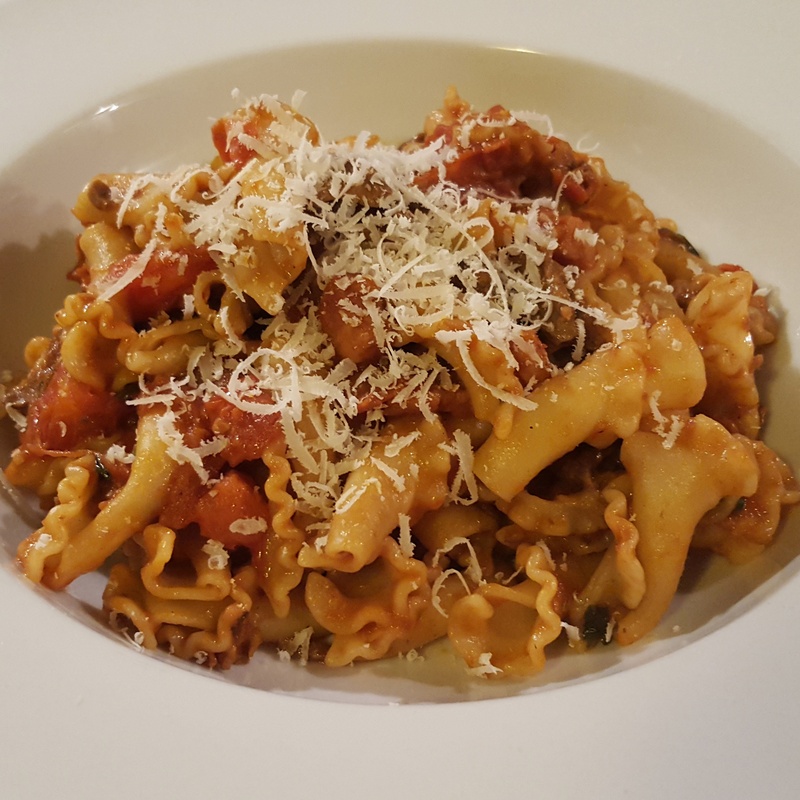 Not only do you get a pie recipe with this but you can also use the wild boar base as a ragu which is delicious with pasta or creamy polenta so you get two ideas for one here! Now just a quick word about mashed potato. I know potato ricers are popular up and down the country for a super smooth mash but I prefer to use a little (read ‘lot’) of elbow grease and mash for England with a good old stick masher! Yes, it is more time and labour intensive but it is still just as smooth so pick your weapon of choice and get mashing! 1. Get cracking by preheating the oven to 160c/ 140 fan. Take a large casserole pan and heat a good glug of oil over a medium to high heat. Add the chunks of boar and cook to brown them off. You can do this in a couple of batches so you don’t overcrowd the pan as this does not make for beautifully golden meat. When browned, remove the boar and set aside. 2. Next up keep the meat juices in the pan and cook the garlic, onion and pancetta (if using) until the onion is softened and the pancetta is turning golden. Pop in the carrot and celery and cook for a further couple of minutes. Stir through the tomato puree and make sure it is all well combined. 3. Add the red wine and reduce by half before the stock, tomatoes and porcini go in. Pop in the herbs, juniper berries and season. Cover the pan and cook in the oven for 3 hours until the boar is tender and simply falls apart. Towards the end of cooking check the boar and the sauce should have reduced down; if it is still a bit too loose, simply remove the lid and finish off or simmer on the hob with the lid off. When the sauce is thick, remove from the heat and set aside as you make the mash. 4. Bring a large pan of salted water to a boil. Boil the potatoes until they are tender when you prick them with a knife; drain well. Now for the bit that takes tasting to get spot on! Mash the potatoes like your life depends on it and add as much butter as your heart will take so give a creamy mash. Add a glug or two of milk if you like. Keep tasting as you go (I know, such a hardship!) until you end up with a creamy, well seasoned mash. 5. When the boar has cooled slightly, tip it into a large ovenproof dish and you are ready to top it with the potato. Now here comes another choice for you: to pipe or to dollop (very technical!) that is the question? I kept it simple for myself on this occasion and spooned some of the mash on before using the back of a spoon to smooth it over the boar. Take a fork and use the tines to lightly make indents. Top with a little freshly grated parmesan if you like and bake at 200c/ 180fan for around 30 minutes until bubbling and golden. Wild boar and porcini forest pie- time to reinvent the classic cottage pie! There is one thing that I simply can’t get enough of in autumn… wild mushrooms! This dish balances the earthiness fragrance of the mushrooms with the delicate sweetness of the squash (my other current fascination). Make use of the abundance of different types of squash and try something new- step away from the old faithful butternut! 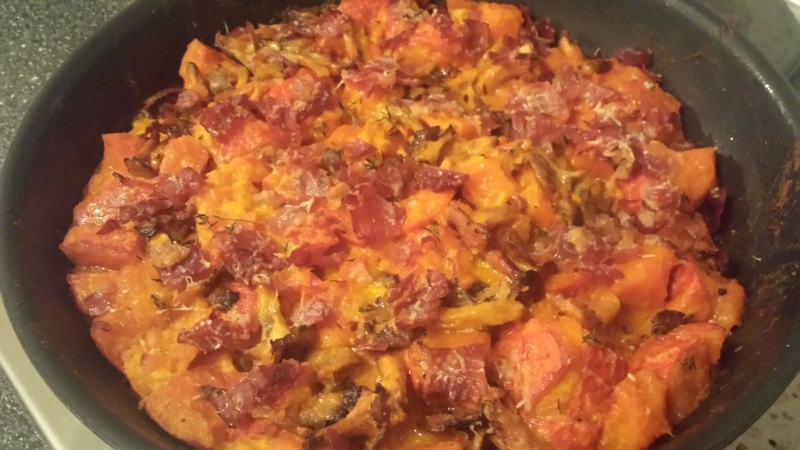 I have used onion squash here so give this a go! 1. Start off by pre- heating the oven to 180c/ 160fan. Warm half the oil in a large non- stick frying pan over a medium heat on the hob and add the shallot, cubed squash and seasoning. Cover and cook for 15minutes until the squash is tender. This can also be roasted in the oven in a roasting tray with a drizzle of oil and some seasoning if you prefer. 2. Meanwhile, in a separate pan heat the remaing oil and fry the wild mushrooms until light golden. Use a slotted spoon to remove these from the pan and set aside before adding ribbons of speck to the pan to crisp up; again, when ready set aside. 3. When the squash is tender (you should be able to put the point of knife through the cubes easily), add the mushrooms and mix gently. Pop in the hot vegetable stock and cook until most of the stock has evaporated. At this point, stir in the creme fraiche. Next up goes the thyme which you need to remove from the stalk and sprinkle the leaves through the mixture. Last but not least add the crispy speck (if you haven’t already eaten it as you were cooking- always the risk!) and scatter over the top. You can also grate some postman over the top if you like. 4. Cover the pan and pop in the oven and cook for 45- 60 minutes. It can be served as a hearty main or as a side dish so take your pick! It would go well with a simple meat dish so you can taste each delicate flavour. Wild mushroom and onion squash gratin- an autumnal gratin to rule them all!